Matthew Apgar - mapgar@shawmedia.com Ryan Aklinski has his head shaved by cross country and track coach Cas Creighton during the St. Baldrick's event at Woodstock North High School on Friday, March 23, 2018 in Woodstock. Participants raised $3,852 for the St. Baldrick's Foundation, which helps fund childhood cancer research. Matthew Apgar - mapgar@shawmedia.com Tyler Gallinger gives a hug to Woodstock North English teacher Tonya Chambers after having his head shaved for the St. Baldrick's event at Woodstock North High School on Friday, March 23, 2018 in Woodstock. Chambers was recently diagnosed with breast cancer, and although Gallinger is not one of her students, they still show support for each other. "We like to spread our positivity," Chambers said. Participants raised $3,852 for the St. Baldrick's Foundation, which helps fund childhood cancer research. 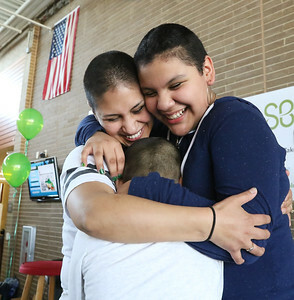 Matthew Apgar - mapgar@shawmedia.com Adriana Urbina (left) hugs her children Dariana (right) and Angel after the family had their heads shaved during the St. Baldrick's event at Woodstock North High School on Friday, March 23, 2018 in Woodstock. Participants raised $3,852 for the St. Baldrick's Foundation, which helps fund childhood cancer research. 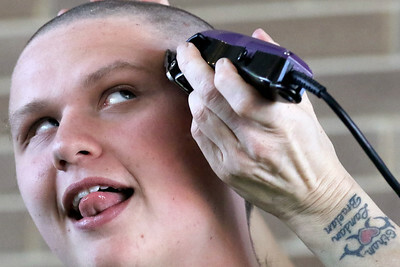 Matthew Apgar - mapgar@shawmedia.com Mason Mathews tries to get a glimpse of the top of his head as cross country and track coach Cas Creighton shaves his head during the St. Baldrick's event at Woodstock North High School on Friday, March 23, 2018 in Woodstock. Participants raised $3,852 for the St. Baldrick's Foundation, which helps fund childhood cancer research. Matthew Apgar - mapgar@shawmedia.com Ryan Aklinski reaches up to feel the top of his head after it was shaved during the St. Baldrick's event at Woodstock North High School on Friday, March 23, 2018 in Woodstock. Participants raised $3,852 for the St. Baldrick's Foundation, which helps fund childhood cancer research. Matthew Apgar - mapgar@shawmedia.com Ryan Aklinski lets out a hearty laugh as his long blond hair falls to the floor during the St. Baldrick's event at Woodstock North High School on Friday, March 23, 2018 in Woodstock. Participants raised $3,852 for the St. Baldrick's Foundation, which helps fund childhood cancer research. 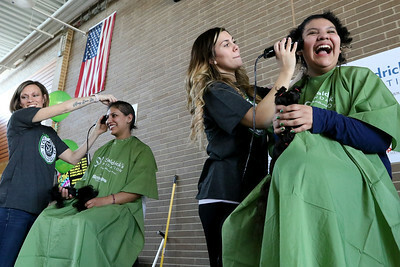 Matthew Apgar - mapgar@shawmedia.com Dariana Urbina (right) lets out a laugh as she holds locks of her hair while her mother, Adriana Urbina (left), also has her head shaved during the St. Baldrick's event at Woodstock North High School on Friday, March 23, 2018 in Woodstock. Participants raised $3,852 for the St. Baldrick's Foundation, which helps fund childhood cancer research. 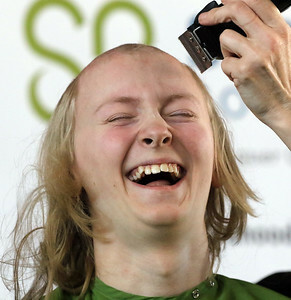 Matthew Apgar - mapgar@shawmedia.com Haylee Schuler holds locks of her hair after getting her head shaved during the St. Baldrick's event at Woodstock North High School on Friday, March 23, 2018 in Woodstock. 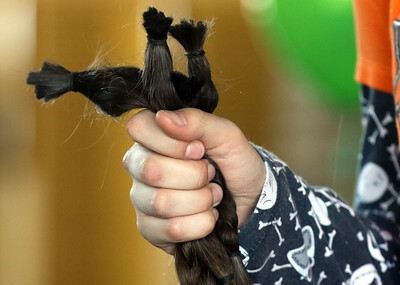 Participants raised $3,852 for the St. Baldrick's Foundation, which helps fund childhood cancer research. 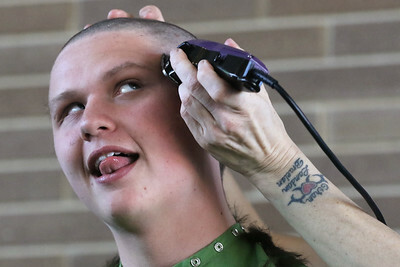 Ryan Aklinski reaches up to feel the top of his head after it was shaved during the St. Baldrick's event at Woodstock North High School on Friday, March 23, 2018 in Woodstock. 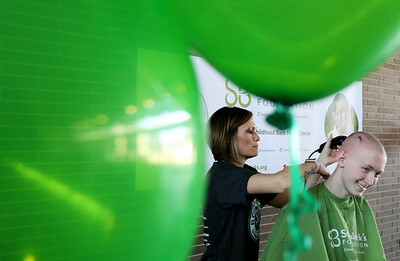 Participants raised $3,852 for the St. Baldrick's Foundation, which helps fund childhood cancer research.